Photo courtesy of Jason Snell at Six Colors. At its media event held earlier today in Cupertino, Apple announced an update to its Mac mini line. Described by Phil Schiller's as "the world's most efficient" desktop computer, the new Mac mini comes with two Thunderbolt 2 ports, new fourth generation Intel Core processors, and 802.11ac WiFi. Packing an "entire Mac experience" in a small 7.7-inch-square frame, the new Mac mini will come pre-installed with OS X Yosemite and also offer four USB 3 ports. The new Mac mini comes in three configurations, with the base model starting at $499 for 4 GB of RAM and a 500GB (5400-rpm) hard drive. Bad news: No longer able to upgrade Mac mini RAM on your own. 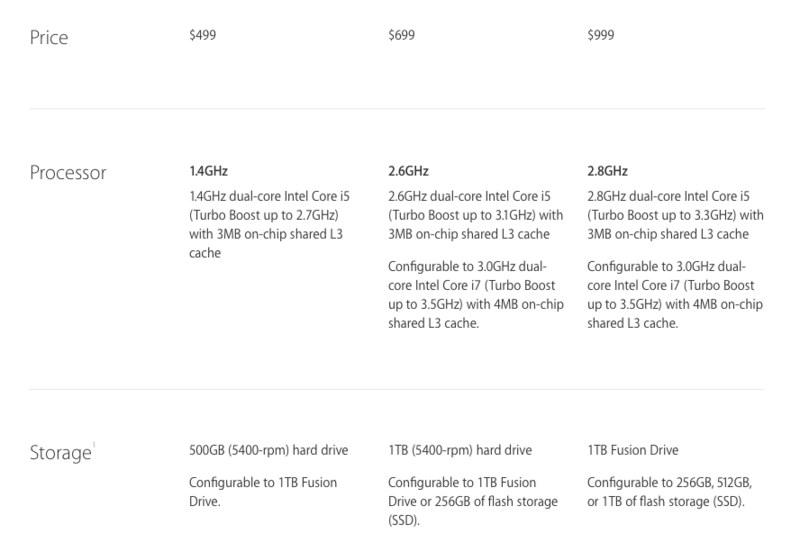 Not so bad news: Apple only charges $200 for 16GB now. Apple's new Mac mini is available today. You can read more details at Apple's website and browse the tech specs here; Apple's official press release is available here. For more coverage, check out our October 16 news hub and follow @macstoriesnet on Twitter.